We have carved a niche amongst the most dominant names in this domain, instrumental in providing an excellent quality range of Welding Goggles. Our patrons can avail from us a complete series of Welding Goggles. Besides, we also provide this product to our patrons at nominal prices. We are manufacturing and import the Welding Goggles products from universal market in competitive price. We have maintaining the entire ranges of Welding Goggles products. Enriched with vast industrial experience in the industry, we offer performance based array of Arc Welding Goggle that are easy to fit and are sturdy in looks. Our entire product range has smooth finishing and is compact in designs. Arc Welding Goggle is offered with customized solutions. 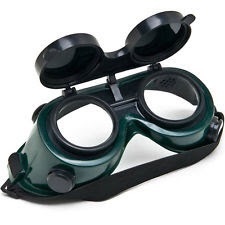 Offering welding goggles that are widely used in various industries and factories to protect eyes from glaring lights that occur during welding. We manufacture, export and supply the optimum quality Welding Goggles that ensure maximum protection of the eyes against the adverse effects of welding. Our Welding Goggles can easily be cleaned by a conventional lens cleaner. Welding Goggles with Two-in-one type for Welding and Grinding applications. The goggles are easy fit and commonly used for Grinding, Gas Welding and Brazing Applications. 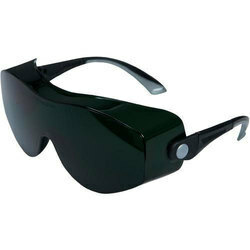 - Non - fog replaceable lenses. - Protection cannot stratch or feel off unaffected by chemicals. - Clean with conventional lens cleaner. - "Lift front goggle has shade #11 glasses filter with polycarbonate cover & chipping lens. - Flip - up goggles stationery frame is fitted with ophthalmic grade zero power toughened lenses & titing frame. - Fitted in either Blue for Furnance, Green shade No.4 for Gas Cutting and Dark Green No.11 glasses for ARC Welding.